The college football landscape got a lot more interesting this week with the concussion of the Tebow Child. 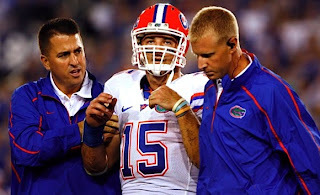 As you can see in the picture of him being carried off the field, Tebow is not really aware of, well, anything. I've been talking to people about this Florida dynasty for quite some time now, and the one thing that I always return to is health; Tim Tebow, for his aggressive style of running and go-gett'um attitude has been remarkably healthy over the last two years. It's not necessarily that I want to see Tebow get injured. But I want to see what happens to this team when they lose their leader and the crux of their offense who, in some act of God, has remained healthy while running head first into linebackers for two years. A diarist on MGoBlog did a fairly extensive analysis on the durability of the different types of quarterbacks (pro style, running back-like, dual threat). It's truly worth a read, but long story short, Tebow's style of play would put him in position to get injured only slightly more than an average quarterback. But it's the way he plays the game--head down, running through linebackers at all costs--that makes me feel otherwise. Either way, Florida is now in the midst of their SEC lineup and will, likely, be without Tebow (or Tebow as the unstoppable force he once was) for the next few games.